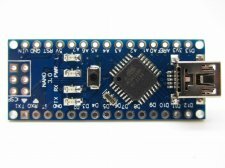 The arduino Nano is a small, complete, and breadboard-friendly board based on the ATmega328 (arduino Nano 3.0) . It has more or less the same functionality of the arduino Duemilanove, but in a different package. It lacks only a DC power jack, and works with a Mini-B USB cable instead of a standard one. The arduino Nano can be powered via the Mini-B USB connection, 6-7V unregulated external power supply (pin 30), or 5V regulated external power supply (pin 27). The power source is automatically selected to the highest voltage source.